The final buzzer sounded, setting off a mini mosh pit of bouncing Beavers just in front of press row. On the opposite sideline, Beaverton head coach Kathy Adelman-Naro pumped her first, clapped her hands emphatically, turned and waived toward a couple of fans joining in the standing ovation behind her. The bliss on the faces of each Beaverton girls basketball player said it all. As the No. 3 seed in the Class 6A state tournament, the Beavers were better than advertised in the 6A quarterfinals against Sheldon. Beaverton was willingly selfless, passing the ball with zeal, scoring in systematically, defending in punishing fashion. Their stars were exceptional and their complementary players chipped in big-time. All in all, sans a wobbly first two minutes, Beaverton played its best of the season to date in axing the Irish 60-45 on Wednesday at the Chiles Center. Laura Erikstrup led the Beavers with 14 points and 11 rebounds while her twin sister Sydney Erikstrup had 13 points, five assists and four boards. Sophomore point guard Mary Kay Naro was brilliant, stuffing the stat sheet with 13 points, 6 assists, 6 boards and three steals. Alexa Borter came off the bench and buried three three-pointers and Mackenzie Naro cashed in a pair of threes as well. 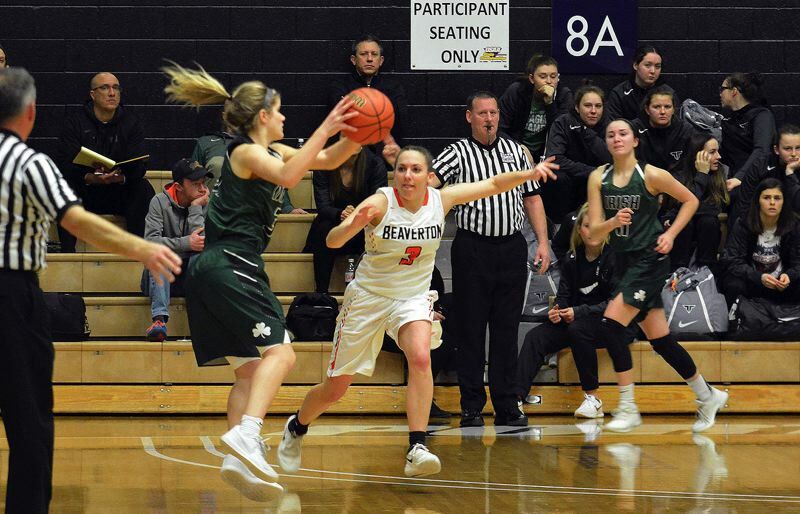 "We were connected, we were in it, we were making the right passes, seeing open teammates, it just so fun to play like that," Beaverton sophomore Sydney Erikstrup said. In the first 2 minutes and 12 seconds of the game, Beaverton suffered a bit stage fright, playing at the Chiles Center for the first time as a group. Sheldon jumped out to an 8-0 lead, thanks to a trio of Beaverton turnovers. But Adelman-Naro called timeout, to steady the troops and let her young squad's nerves subside. After the 30-second break, Beaverton blew Sheldon's doors down. The Beavers counterpunched with a 9-0 spurt in just over 90 seconds, breaking the Irish's fullcourt press and getting easy buckets. 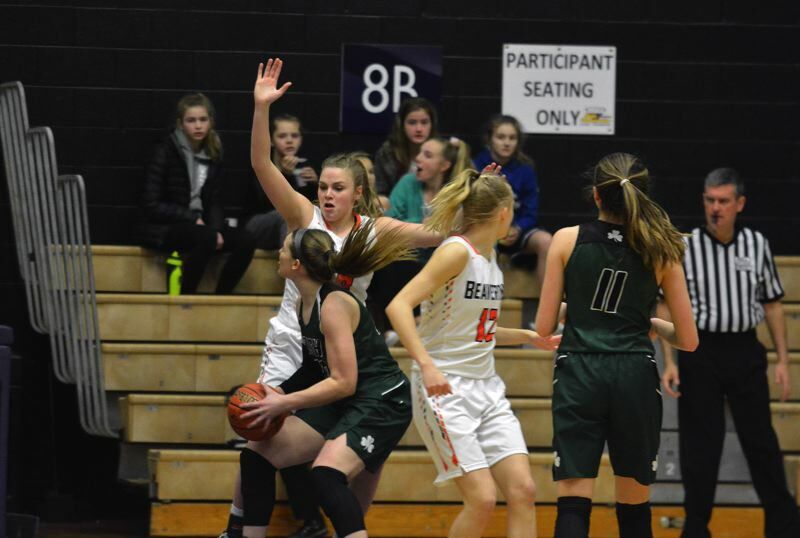 The avalanche continued as Beaverton went on an 11-0 run filled with Borter, Mary Kay Naro, and Mackenzie Naro all making threes to coincide with the Erikstrups' adept ability to finish around the rim. Following the early deficit, Beaverton outscored the Irish 20-4 the rest of the period to take a commanding 20-11 lead at the end of one. "We just relaxed," Mary Kay Naro said. "We were pretty uptight. I know I was. It's the first game at the Chiles Center. Everyone's excited and really wants to win. Once we settled down, took our time and do what we do, we were fine." "I don't think our focus was where it needed to be and that was our wakeup call," Sydney Erikstrup said. "Once we got it going there was no looking back. We just went for it. We let go of the nerves, started playing loose and having fun. We were happy to play and play our game." Mary Kay Naro and Sydney Erikstrup are gifted ballhandlers with great court vision, prudent decision making and evasive dribbling ability. At times, Mary Kay Naro broke Sheldon's press by herself, splitting traps with bursts of speed, making Irish defenders look foolish with full speed ankle-breaking crossovers as Sheldon tried to swipe at the sophomore floor general. "I knew I could get around them, I just had to do a better job of taking care of the ball," Mary Kay Naro said. "It just made the game so much more fun. We were able to get up and down and get into the flow of the game, especially after a rough start. We took the lead and ran with it." Sydney Erikstrup shared in the ballhandling duties as well, spoon-feeding her sister and Borter for a pair of paint baskets in the second half. The primary handlers were frenetic in tempo, but kinetic when it came to dispersing the ball. Sheldon's full-court defense played right into Beaverton's hands. Once Mary Kay Naro broke the press on her own and ignited the offense, the selfless Beavers feasted on advantageous three-on-two and two-on-one scenarios. Beaverton always made the right pass, at the right moment to get the optimum shot. Of Beaverton's eight third-quarter field goals, six were assisted as the Beavers opened up a 48-36 lead. Barton scored eight of her 11 points in the third and Laura Erikstrup scored twice inside. Unobstructed threes and easy layups came by the bushel as Mary Kay Naro and Sydney Erikstrup kept pushing the pace and ripping passes to open players. Beaverton combated Sheldon's flocking defense with its self-sacrificing brand of basketball that's become the trademark of this team. "We don't care who scores," Mary Kay Naro said. "Sometimes on other teams, that's the focus. (Adelman-Naro) preaches to us all the time to move the ball, pass the ball, get a better shot. She keeps us on our toes so that we get the best shot possible. And we don't have any selfish players on our team. We all want to win. We're all great and we all work well together. It's just an awesome mix and we brought it together today and took it to 'em." Every key player in Beaverton's rotation plays AAU basketball during the off-season. Many of the Beavers have college hoops aspirations and some like the Erikstrups and Naro want to play high major D1 ball. Individually they want to earn scholarships, yet none of the Beavers are interested in getting their personal numbers up or trying to impress scouts with high-scoring, high-volume outings. They play for each other, look for each other and share the ball in an altruistic fashion that belies their individual stature as prospects. Every time an Erikstrup a Naro or Borter made a shot they were quick to throw up their index finger and point toward the comrade who set them up for the hoop, acknowledging their teammate's assist. "We love seeing each other succeed," Sydney Erikstrup said. "Even if you set the screen that gets somebody open, it's like an assist. If someone drains a three, we're all up on our feet. It's amazing. It definitely gets our energy and momentum going and brings us together." Beaverton's team defense is rooted in sound man-to-man principles. There are no real frills, no gimmicky gadgets that the Beavers throw at teams. They tenaciously stick their opponents with sliding feet, provide help one or two passes away from the ball, always see both their man and the ball and forever back their teammates. Sheldon pulled with 52-45 with 4:45 to go in the fourth, but didn't score a single point the rest of the way. The Irish shot just 28.3 percent from the field as a team and turned the ball over 14 times. "We work really hard on defense," Mary Kay Naro said. "In practice, our coaches are on us to stay low, play the passing lanes. Our defense is coming together at the end of the season, so it's great. We killed it."